Re: Is "ball lightning" simply scattered bead lightning? This afternoon, I actually went out to the specific area that was involved in this incident and measured the distance from where I was standing and where the "bolt" (leader?) emananted. It turns out to be about 13 feet, not 8 feet. The direction of the "arc" was actually from the SE to the NW, and not S to N. The pine trees are still there and the height estimates are still valid. Tomorrow, I will contact the local fire department as to the exact time and date of this incident. This had to be the the most extreme meterological event I've ever seen. I have seen numerous "anvil" clouds; I have seen a couple of "lenticular" clouds: I have even seen 5 simulaneous waterspouis, flying into them in a helicopter; I have seen a "hole-punch" cloud; but I have never seen anything like this before or since. The more I think about it and the more I research it, the more I think this was a segment of "bead lightning" that I saw traversing through the air that Tuesday afternoon.. I think what I saw was a segment of lightning, which I took to be an "arc", which it was, but I can't tie it to that amber ball that was dancing on the screw that mounted the phone company's service panel to the wall of my house. I can only guess, at the moment, that these two things are related in some way, because of the simultaneouty of their occurrance. That's the best I can do for now. Any other members have similar experiences? Yes, it's that easy. The flash of lightning is a flow of charge, with a radial electric field. That takes thermal energy in the surrrounding atmosphere and translates it to radial energy, causing the observed shockwave. ALL of their observations are explained! And you can add that thermal energy is photon density. They need a mechanism to explain how dust and neutral gas(not ions), are efficiently lifted from a star in a bipolar(not spherical) manner. Looks a lot like the thunder problem, just on a larger scale. I'll suggest that an increase in electric field of the star dethermalizes the surrounding gas. This takes the random thermal energy in the neutral gas and dust,and translates it to radial motion, and therefore outward pressure. If the current really does run through a star as in the EU model, this would explain the axial symmetry of the dust/neutral gas ejection. So yes, Thornhill's model of stars is right, but he's forgotten the effect of dethermalization as outward pressure on neutrals. Correct me if I am wrong, but I did not see him mention it in his model of red giant shell ejections or pulsations. 1. Catatumbo has had nearly continous lightning, except during a period of drought. 2. There has already been speculation that uranium in the surrounding bedrock plays a role. 3. Water reacts with uranium to produce hydrogen gas. 4. Radiation from uranium can make a gas highly conductive. 5. Lightning is current running between earth and sun. 6. Electric current is going to take the path of least resistance. I don't think it should be too hard to see what's going on. The turning force applied by the magnetic field causes the charged particle to assume a circular motion around an imaginary field line, coupled with whatever axial motion it started out with when entering the field, if any. This leads to a path with a helical shape in 3D space. If the magnetic field changes direction, so too does the helical path of particles riding along it. The electric field potential (volts per meter) is what accelerates the particle parallel to the magnetic lines of equal potential, and where the axial energy increase comes from. The local magnetic field of the plasma requires more energy from charged particles in motion to move transversely across the lines of magnetic potential than parallel to them. A force is applied to such particles (ions and electrons) to turn them away from their traversing the (imaginary) magnetic field lines and to continue to accelerate them parallel with the field lines. This velocity vector acceleration increases the magnetic field strength, which in turn is able to provide a higher resistance to particles' transverse velocity components.The more parallel they move, the fewer the number of collisions per unit time, and less energy involved in the few glancing, near-parallel collisions. This is dethermalization. Random or Brownian motion gets suppressed or minimized by the steering electromagnetic fields which "parallelize" their flow. The bulb of the ol' solar thermometer (moving with the flow) is not hit as often nor as hard, while the particles themselves stream faster and faster (have more kinetic energy in eV) along the field lines' direction - Re: "Why Lower Corona of the Sun Is Hotter Than the Photosphere"
Okay, that last one may be a bit much but its funny how there can be so many terms to denote when electrical forces take charge of a situation to convey energy not associated with energy due to heat generated by random motion. ... translates it to radial energy, causing the observed shockwave. I agree with the shockwave concept (similar to your Quasar scenario), but wonder if the actual 'boom' of thunder is not that "shockwave" front cracking the sound barrier ? seasmith, the sound barrier in an electric field? now you've left me with more questions. 1. 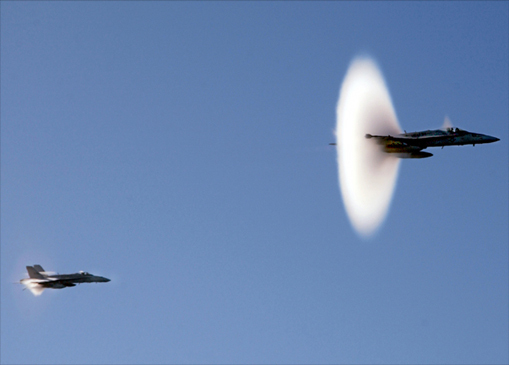 Scientists know that the speed of sound in a plasma (and other materials) is dependent on the electric field. They use helioseismology to determine what is happening in the sun based on sound waves at the surface. They are not allowing for any strong electric fields. So when they tell us that the sun has no significant s-waves (shear waves across the sun), are they just telling us what we already know? That the sun has a radial electric field, not a strong time-varying field across its surface? 2. when they look at shock waves in supernova remnants, they are not allowing for strong electric fields. But according to Thornhill,"supernovae are catastrophic electrical disharges focused on a star." Should'nt we be able to look at the remnant's shock waves and tell not only the electric field, but how the field is changing with time or distance from the supernova? 3. did the mainstream consider lightning's electric field in their explanations of thunders' speed of propagation? 4. Shock waves (or lack thereof) in the gas around quasars? Redshift of quasars as plasma or electron density in shockwaves? I don't know any of this. Help! Dispersion and non-linearity can interact to produce permanent and localized wave forms. Consider a pulse of light traveling in glass. This pulse can be thought of as consisting of light of several different frequencies. Since glass shows dispersion, these different frequencies will travel at different speeds and the shape of the pulse will therefore change over time. However, there is also the non-linear Kerr effect: the refractive index of a material at a given frequency depends on the light's amplitude or strength. If the pulse has just the right shape, the Kerr effect will exactly cancel the dispersion effect, and the pulse's shape won't change over time: a soliton. See soliton (optics) for a more detailed description. Regardless of what shocking wave is initiating a 'front', there are typically a host of impinging phases which, if driven with sufficient energy relative to the ambient space, will resolve into a more coherent form. Phase velocities average into a group velocity, near-field radiations morph into a far-field carrier wave, ocean wavelets combine into traveling waves, and etc. A sub-atomic analogy might be the transcending of a "band gap"? A concept being considered here is that in an event where energetic emissions/radiations, at first diffuse, explosively fuse; the conjunctive energetic 'soliton' may re-radiate and assume a different mode of propagation. We know thunder has an outward pressure that can not be explained based on temperature alone. And now they see a "significant, as yet undetected, non-thermal component to the pressure in the local cloud". In the case of thunder, the mainstream already suspects that electrical forces in lightning are involved. Could it be that electrical forces also contribute to the pressure in the local cloud, and by the the same mechanism? That would mean that we would have to have some kind of current flowing through the local cloud. But large scale electrical currents in space? That's just crazy. But I'm a bit of a dilettante with EU science, and supporting theories. My background is more on the humanities and computer science side of things. I'd love to see a Thunderbolts Picture of the Day (TPOD) write up on Catatumbo.